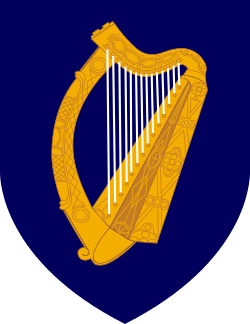 Between 1866 and 1871, the Fenian raids of the Fenian Brotherhood, an Irish Republican organization based in the United States, on British army forts, customs posts and other targets in Canada, were fought to bring pressure on Britain to withdraw from Ireland. They divided Catholic Irish-Canadians, many of whom were torn between loyalty to their new home and sympathy for the aims of the Fenians. The Protestant Irish were generally loyal to Britain and fought with the Orange Order against the Fenians. While the U.S. authorities arrested the men and confiscated their arms, there is speculation that some in the U.S. government had turned a blind eye to the preparations for the invasion, angered at actions that could have been construed as Canadian assistance to the Confederate States of America during the American Civil War. There were five Fenian raids of note and all of them ended in failure. Led by John O'Mahony, this Fenian raid occurred in April 1866, at Campobello Island, New Brunswick. A Fenian Brotherhood war party of over 700 members arrived at the Maine shore opposite the island intending to seize Campobello from the British. British commander Charles Hastings Doyle, stationed at Halifax, Nova Scotia responded decisively. On 17 April 1866 he left Halifax with Royal Navy warships carrying over 700 British regulars and proceeded to Passamaquoddy Bay, where the Fenian force was concentrated. This show of British might discouraged the Fenians, and they dispersed. The invasion reinforced the idea of protection for New Brunswick by joining with the British North American colonies of Nova Scotia, and the United Province of Canada, formerly Upper Canada (now Ontario) and Lower Canada (Quebec), to form the Dominion of Canada. The Fenians now split into two factions. 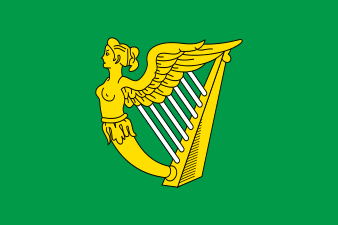 The original faction led by Fenian founders James Stephens and John O'Mahony focused more on fundraising for rebels in Ireland. The more militant "senate faction" led by William R. Roberts believed that even a marginally successful invasion of the Province of Canada or other parts of British North America would provide them with leverage in their efforts. After the failure of the April attempt to raid New Brunswick, which had been blessed by O'Mahony, the senate faction implemented their own plan for invading Canada. Drafted by the senate "Secretary for War" General T. W. Sweeny, a distinguished former Union Army officer, the plan called for multiple invasions at points in Canada West (now southern Ontario) and Canada East (now southern Quebec) intended to cut Canada West off from Canada East and possible British reinforcements from there. Key to the plan was a diversionary attack at Fort Erie from Buffalo, New York, meant to draw troops away from Toronto in a feigned strike at the nearby Welland Canal system. This would be the only Fenian attack, other than the Quebec raid several days later, that would be launched in June 1866. Approximately 1000 to 1,300 Fenians crossed the Niagara River in the first 14 hours of June 1 under Colonel John O'Neill. Sabotaged by Fenians in its crew, the U.S. Navy's side-wheel gunboat USS Michigan did not begin intercepting Fenian reinforcements until 2:15 p.m. — fourteen hours after Owen Starr's advance party had crossed the river ahead of O'Neill's main force. Once the USS Michigan was deployed, O'Neill's force in the Niagara Region was cut off from further supplies and reinforcements. The Canadian militia consisted of inexperienced volunteers with no more than basic drill training but armed with Enfield rifled muskets equal to the armaments of the Fenians. A single company of the Queen's Own Rifles of Toronto had been armed the day before on their ferry crossing from Toronto with state-of-the-art 7-shot Spencer repeating rifles, but had not had an opportunity to practise with them and were issued with only 28 rounds per man. The Fenians were mostly battle-hardened American Civil War veterans, armed with weapons procured from leftover war supplies, either Enfield rifled muskets or the comparable Springfield. The opposing forces exchanged volleys for about two hours, before a series of command errors threw the Canadians into confusion. 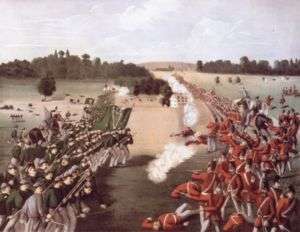 The Fenians took advantage of it by launching a bayonet charge that broke the inexperienced Canadian ranks. Seven Canadians were killed on the battlefield, two died shortly afterwards from wounds, and four would later die of wounds or disease while on service; ninety-four more were wounded or disabled by disease. Two Fenians were killed and sixteen wounded. After the battle, the Canadians retreated to Port Colborne, at the Lake Erie end of the Welland Canal. The Fenians rested briefly at Ridgeway, before returning to Fort Erie. Another encounter followed that saw several Canadians severely wounded and the surrender of a large group of local Canadian militia who had moved into the Fenian rear. After considering the inability of reinforcements to cross the river and the approach of large numbers of both militia and British regulars, the remaining Fenians released the Canadian prisoners and returned to Buffalo early in the morning of June 3. They were intercepted by the gunboat Michigan and surrendered to the American navy. Until recently it was alleged that the turning point in the battle was when Fenian cavalry was erroneously reported and the Canadian militia ordered to form square, the standard tactic for infantry to repel cavalry. When the mistake was recognized, an attempt was made to reform in column; being too close to the Fenian lines, it failed. In his recent new history of Ridgeway, however, historian Peter Vronsky argues the explanation was not as simple as that. Prior to the formation of the square, confusion had already broken out when a unit of the Queen's Own Rifles mistook three arriving companies of redcoat Hamilton 13th Battalion for British troops. When the Queen's Own Rifles began retiring to give the field to what they thought were British units, the 13th Battalion mistook this for a retreat, and began withdrawing themselves. At this moment that the infamous "form square" order was given, completing the debacle that was unfolding on the field. A board of inquiry determined that allegations over the alleged misconduct of Lieutenant-Colonel Alfred Booker (13th Battalion), on whom command of Canadian volunteers had devolved, had "not the slightest foundation for the unfavourable imputations cast upon him in the public prints". Nevertheless, the charges dogged Booker for the rest of his life. A second board of inquiry into the battle at Fort Erie exonerated Lieutenant-Colonel J. Stoughton Dennis, Brigade Major of the Fifth Military District, although the President of the Board of Inquiry, Colonel George T. Denison, differed from his colleagues on several key points. Five days after the start of the invasion, U. S. President Andrew Johnson issued a proclamation requiring enforcement of the neutrality laws, guaranteeing the Fenian invasion could not continue. Generals Ulysses S. Grant and General George Meade went to Buffalo, New York to inspect the situation. Following instructions from Grant, Meade issued strict orders to prevent anyone from violating the border. Grant then proceeded to St. Louis. Meade, finding that the battles were over and the Fenian army interned in Buffalo, went to Ogdensburg, New York, to oversee the situation in the St. Lawrence River area. The U.S. Army was then instructed to seize all Fenian weapons and ammunition and prevent more border crossings. Further instructions on 7 June 1866 were to arrest anyone who appeared to be a Fenian. In June 2006 Ontario’s heritage agency dedicated a plaque at Ridgeway on the commemoration of the 140th anniversary of the battle. Many members of today's Canadian army regiment, The Queen's Own Rifles of Canada, return to the Ridgeway battle site each year on the weekend closest to the June 2 anniversary for a bicycle tour of the battle sites. Alexander Muir, a Scottish immigrant, author of the "The Maple Leaf Forever" and member of the Orange Order, fought at Ridgeway with the Queen's Own Rifles. A Fenian commander was Brigadier General Thomas William Sweeny, who was arrested by the United States government for violating American neutrality. Nevertheless, he was soon released and served in the Regular Army until he retired in 1870. After the invasion of Canada West failed, the Fenians decided to concentrate their efforts on Canada East. However, the American government had begun to impede Fenian activities, and arrested many Fenian leaders. The Fenians soon saw their plans begin to fade. General Samuel Spear of the Fenians managed to escape arrest, and, on June 7, Spear and his 1000 men marched into Canadian territory, achieving occupancy of Pigeon Hill, Frelighsburg, St. Armand and Stanbridge. At this point the Canadian government had done little to defend the border, but on June 8 Canadian forces arrived at Pigeon Hill and the Fenians, who were low on arms, ammunition and supplies, promptly surrendered, ending the raid on Canada East. This Fenian raid occurred during 1870, and the Canadians, acting on information supplied by Thomas Billis Beach, were able to wait for and turn back the attack. The Battle of Trout River was a military conflict that occurred on 27 May 1870. It was a part of the Fenian raids. This battle occurred outside of Huntingdon, Quebec near the international border about 20 kilometres (12 mi) north of Malone, New York. The location of this battle should not be confused with Trout River in the Northwest Territories. Fenian John O'Neill, after the failed 1870 Fenian invasion of Canada, had resigned the Senate Wing then joined the Savage Wing. In return he was given a seat on the Savage Wing governing council. In 1871 O'Neill and an odd character named W. B. O’Donoghue asked the Savage Wing Council to undertake another invasion of Canada across the Dakota Territory border. The Council, weary of Canadian adventures in general and O’Neill in particular, would have none of it. O'Neill's idea was turned down, but the Council promised to loan him arms and agreed they would not publicly denounce him and his raid. O'Neill resigned from the Fenians to lead the invasion, which was planned in Saint Paul, Minnesota, to invade Manitoba near Winnipeg. About 35 men, led by John O'Neill, William B. O'Donoghue, and John J. Donnelly, hoped to join forces with Louis Riel's French-Indian Métis. 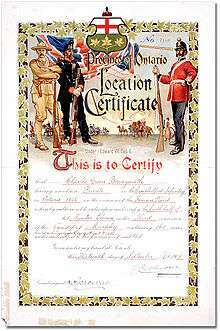 On October 5, O'Neill's force managed to capture a Hudson's Bay Company post and a Canadian customs house which they believed to be just north of the international border. A U.S. survey team had determined the border was two miles further north, placing the Hudson's Bay post and the customs house both inside U.S. territory. O'Neill, J. J. Donnelly and ten others were taken prisoner near Pembina, Dakota Territory, by U.S. soldiers led Captain Loyd Wheaton. The farcical raid was doomed from the very start. It actually took place inside the United States, and the Métis under Riel had signed a pact with the British just as the invasion began. Riel and his Métis captured O'Donoghue and gave him to U.S. authorities. In a somewhat muddled federal response, O'Neill was arrested twice – once in Dakota and once in Minnesota- but was released and never charged for "invading" U.S. territory. The men captured with him were released by the court as simply "dupes" of O'Neill and Donnelly. The Fenian Brotherhood organized openly in the Pacific Northwest states during the 1870s and 1880s, agitating to invade British Columbia. Although no raids were ever launched, tensions were sufficient that Britain sent several large warships to the new railhead at Vancouver, British Columbia for the celebrations opening the Canadian Pacific Railway in 1886. Support for the Fenian Brotherhood's invasion of Canada quickly disappeared and there was no real threat after the 1890s. Nevertheless, the raids had an important effect on all Canadians. The Fenian raids caused an increased anti-American feeling in Canada and the Maritimes because of the U.S. government's perceived tolerance of the Fenians when they were meeting openly and preparing for the raids. The raids also aroused a martial spirit among Canadians by testing the militia's strength. Because of their poor performance, the militia took efforts to improve themselves. This was achieved without the huge cost of a real war. The greatest impact of the Fenian raids was in the developing a sense of Canadian nationalism and leading the provinces into a Confederation. This was seen as necessary for survival and self-defense; the raids showed Canadians that safety lay in unity and were an important factor in creating the modern nation-state of Canada. Raid on Port Dover: A preceding US army raid of Canada in 1814, as part of the War of 1812. ↑ Brian Loveman (2010). No Higher Law: American Foreign Policy and the Western Hemisphere since 1776. Univ of North Carolina Press. p. 124. ISBN 978-0-8078-9598-6. ↑ "The Fenian Raids – 1866" (PDF). niagarafallsmuseums.ca. Human Resources Development SCP Grant / 1997. Retrieved 19 October 2014. ↑ "Fenian raids". Dictionary of Canadian Biography (online ed.). University of Toronto Press. 1979–2016. ↑ Dallsion, Robert L. Turning back the Fenians: New Brunswick's Last Colonial Campaign Goose Lane Edition. 2006. ↑ The Fenian raid at Fort Erie, June the first and second, 1866: with a map of the Niagara Peninsula, shewing the route of the troops, and a plan of the Lime Ridge battle ground. Toronto: W.C. Chewett & Co., 1866. ↑ Log Entry, Friday June 1, 1866, USS Michigan Logbook No. 16, July 24, 1864, to August 30, 1866: Logbooks of U.S. Navy Ships, 1801–1940, Records of the Bureau of Naval Personnel, 1798–2003, RG24. (National Archives Building, Washington, DC) NARA. 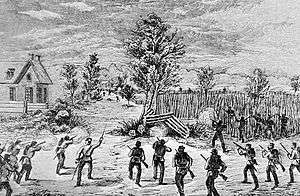 ↑ O'Neill's strength in the Fenian camp at Frenchmen's Creek was estimated at 250 by a Canada West Frontier Police detective who infiltrated the camp. He also reported that later in the night an additional 200 Fenians joined the column from the camp, bringing the total to at least 450. See: Detective Charles Clarke to McMicken, telegram, June 2, 1866, MG26 A, Volume 237, p. 103878 [Reel C1663] Canada Archives. ↑ Fenian Brotherhood. Proceedings of the second National Congress of the Fenian Brotherhood, held in Cincinnati, Ohio, January 1865. Philadelphia: J. Gibbons, 1865. ↑ Peter Vronsky, Ridgeway: The American Fenian Invasion and the 1866 Battle That Made Canada, Toronto: Penguin-Allen Lane, 2011. pp. 141–145. 1 2 3 Neidhardt, W.S. Fenianism in North America The Pennsylvania State University Press. 1975. ↑ Regan, Ann (2002). Irish in Minnesota. Minnesota Historical Society Press. pp. 44–45. ISBN 0-87351-419-X. ↑ "Canadian General Service Medal – Veterans Affairs Canada". Retrieved 2010-05-17. ↑ Senior, Hereward. The Last Invasion of Canada: The Fenian Raids of 1866–1870 Dundurn Press. 1991. Vronsky, Peter Ridgeway: The American Fenian Invasion and the 1866 Battle That Made Canada., Toronto: Penguin Canada-Allen Lane, 2011. Dallsion, Robert L. Turning back the Fenians: New Brunswick's Last Colonial Campaign Goose Lane Edition. 2006. Wikimedia Commons has media related to Fenian Raids. "Security-Intelligence Functions of the Toronto Police During the Civil War Era and the Fenian Threat"